When thinking about what to consider when installing metal railings on a wall, the main considerations are cost, appearance, the likely usage and the stability of the existing wall. The main fixing options when installing metal railings on a wall include mounting using base plates and resin sealant, or grouting the railings into the wall using core drilled holes. Both options may require the use of a backstay to provide added stability. Base plating is the cheaper, most commonly used option installing metal railings on a wall, but this means that a square plate will be visible at the base of each railing which will affect appearance. To avoid this, the slightly more costly option is to mount using core drilled holes. Some wall may also have a copping stone topping so consideration needs to be given to the quality and thickness of the coping stone and whether it will withstand usage. When considering usage, the surveyor must assess how likely it is that people will be tempted to climb the railings or will try to pull them over. The surveyor will consider these factors when recommending the height of the railings and their fixing option. To further strengthen the installation, the use of a backstay may be required to provide added stability. The age and condition of the wall will also affect this decision as will the type of brick being used. Older walls may have been built using solid bricks which means that you will be drilling through solid brick and will not meet any voids in the brick which will need to be filled with grout. However, an older wall may be slightly less stable than a new wall. If voids are encountered, a ‘sieve’ will be installed. This is a mesh tube into which the resin sealant is squeezed. The resin seeps through the mesh to fill the void and the fixing is secured. Low height metal railings can be safely base plated using four bolts at each corner of a metal plate which is fixed to the bottom of each upright. The bolts are then resin sealed into the top of the wall or a coping stone. For additional decorative effect, to avoid seeing the base plate, it can also be mounted at the back of the wall and cantilevered forward. However, consideration must be given to whether this fixing will be suitable based on the likely usage of the wall. The neatest and more secure fixing option when installing metal railings on a wall is to diamond core drill holes into the wall and cement the posts into them. The holes will normally be at least 12 inches (300mm) deep and, when mounted using specialist resin and cement, will withstand 50 newtons of force. This fixing option is therefore much stronger and suitable for taller railings or scenarios where there may be a temptation to climb railings or pull on them. Using backstays adds further stability to the railings. 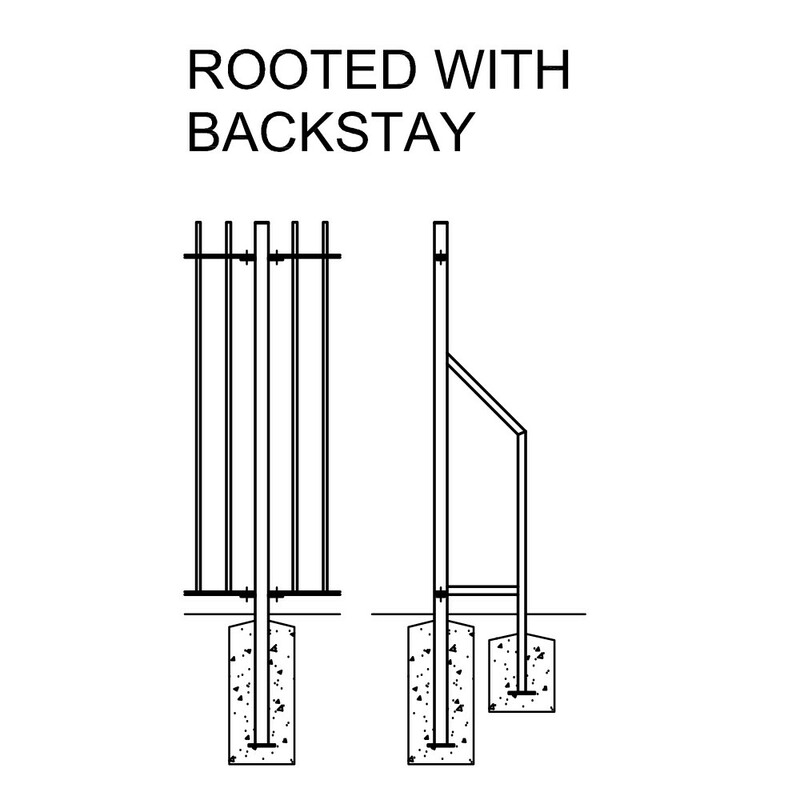 This option is normally used on low walls, where the railings are baseplated and the back stay is rooted into the ground. The introduction of a back stay doubles the stability and makes it rock solid. To reduce the cost of brickwork or to improve visibility and appearance, some walls are built with brick pillars (piers) rising upwards at intervals and metal railings are installed within the gaps. This is a very attractive option, however, the railings need to be side mounted to the brick pillars, as well as in some instances, base plated into the low wall. 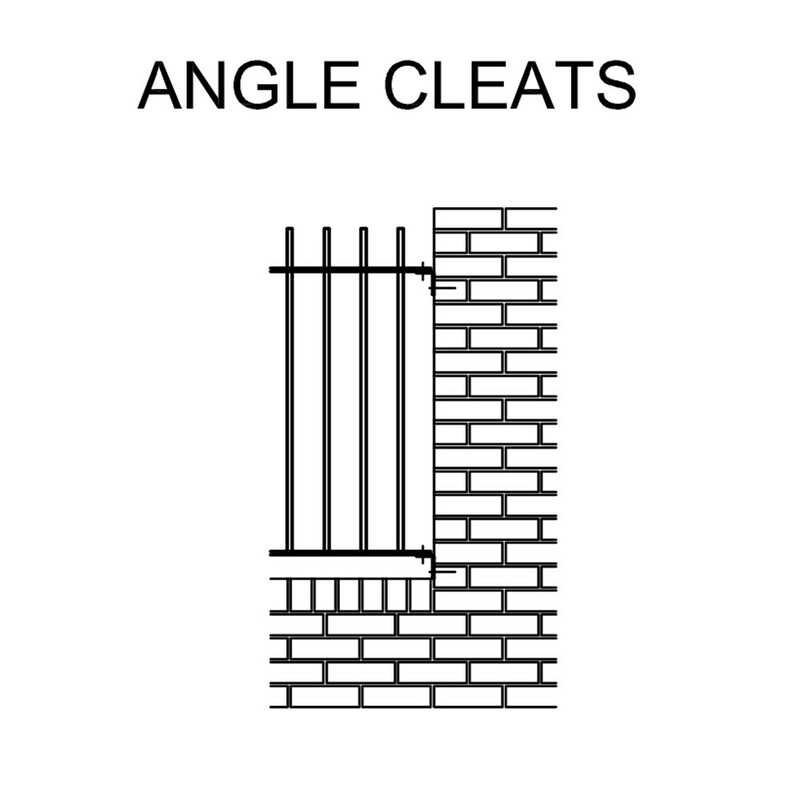 When metal railing are to be installed within the intervals of brick pillars, the railings are attached to the brick pillar using angled cleats which are drilled into the pillar. Alternatively, a more secure option is to bolt a metal wall strap, which is a solid metal plate that rises from top to bottom of the pillar. The bar can be drilled at any number of points and means that the railing can be affixed to the brick pillar using as many fixing bolts as is required to eliminate the risk that the railings could be ripped away. Fishtail lugs can also be used; however, the positioning of the lugs must be pinpoint accurate otherwise there is a risk that the railings will not look level. This is because the fishtail lugs have to be mounted into the cement whilst the brick pillar is being built, relying on the skills of the bricklayer to lay a consistent thickness of the cement between each brick. Subsequent settlement changes will affect the position of the lug in the pillar, therefore the point at which the railing can be fixed may be slightly out, which in turn will affect the ability to ensure the railings look level. To see more fixing options, click here. 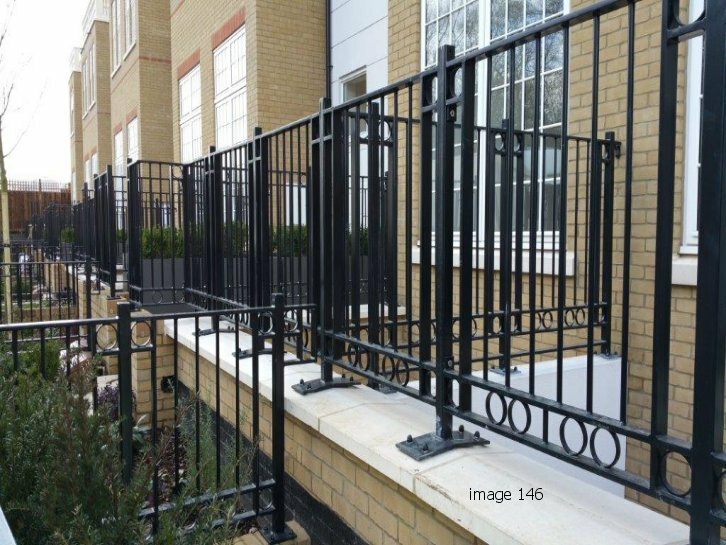 If you are considering installing metal railings on a wall on your next project and would like further advice please get in touch or complete an enquiry form.